What makes a "good" connection? Let's look at the black stones first. There is no way that a white player can separate the two black stones on the bottom. But the player who builds walls one space at a time will soon fall behind. 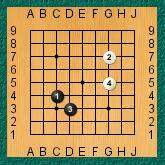 The white player has influence over a larger area of the board than the black player - after only two moves each. So the question is: how far can you get from the first stone and still maintain a good connection? In this case, white could separate the two stones, but it would take two white plays, at D4 and at C3. 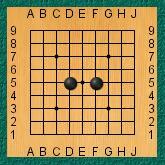 In most cases, if white played D4, black would play C3 (and vice versa), so we can say that two stones next to each other diagonally are effectively connected - always assuming there are no enemy stones on the other two points. You have probably noticed that the white player has been making the same kind of move in both examples so far, although in different directions. This is called a one-space jump. 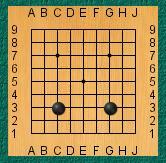 The move is called ikken tobi in Japanese, and there is a Go proverb which says "ikken tobi is always good." 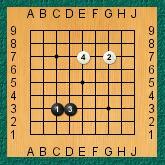 There is now a one-space jump between the two black stones, and it seems clear that white can attempt to separate the two stones by playing between them (at E5 in this diagram.) Black can then put the single white stone in atari as shown in the next diagram. Assuming that white protects that stone by leading it out, black can now make a strong connection with this move at D4, but that still leaves a cutting point. White can play atF4 and split the black position. 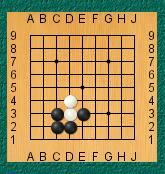 There are various ways that the game could continue, but white has succeeded in separating the two original stones. So does this look like a one-space jump is NOT always good? Without going into it in more detail, I will just say that white playing between the two stones is probably not a good idea, depending on what other stones might be in the area, so the original one-space jump is good. I will have more to say about this later in the discussion about the third line. 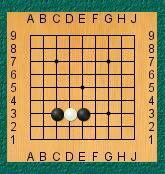 Now the ladder atari no longer works for black, and white has succeeded in breaking black up into two groups. Better players will note that this was not the best move for white, and they are correct, but that is a more advanced subject and those better players probably shouldn't be reading this page anyway. Here is an interesting shape called a bamboo-joint (Japanese takefu. ) It may look artificial but it comes up very often in actual play. It's like two one-space jumps on top of each other. 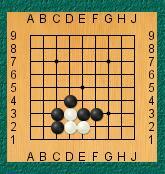 You should be able to verify that there is no way white can separate these stones unless black ignores two moves. This makes it one of the strongest ways to connect groups without actually placing stones right next to one another. One-space jumps on the third line. Black can protect the cut on one side, as we saw before, but does not have to protect the cut on the other side, because a white stone cutting there would be forced to the edge and captured. [ White plays E2, black plays F2 atari.] This naturally leads us to the next discussion - hanging connections. In the last diagram black connected at C2 with a "tight" connection, but sometimes it is better to make a "hanging" connection to push a little further. 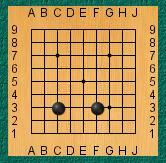 In this diagram, black decided to protect the right side rather than the left, but instead of playing the tight connection at E2, played at F2 - "hanging" off the cutting point. This protects against the cut, but allows the black group to extend a little further to the right. As before, white cannot cut at the other cutting point, C2, without losing the cutting stone. But what happens if black gives atari from the top? 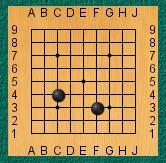 Then things get more complicated, because it depends what other stones are on the board. The first few moves are forced, but after that you may have other considerations to take into account. Assuming no other stones nearby, black can follow along, pushing white on the second line where it is will be impossible to make a two-eyed group. If white plays F2 and G2, black can follow at G3 and H3. 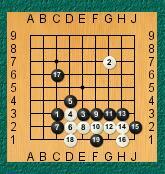 Then when white plays H2,	black stops him at J2. There is no need to stop the advance earlier, and in fact if black tries to stop the line too soon he can get into serious trouble. Here is a (fake) game with the whole sequence. Note that white's attempts to live are hopeless. Black even gets the chance to play move 17 wherever he likes while	white is still struggling in vain. 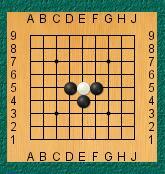 You should be able to see that it does no good for white to try to escape at C1: there is nowhere white can find another eye. Look at the first two cases. If you have a real Go board and stones you should work out what happens if you try to separate these stones. Since we are on the third line, the same general comments apply as for the one-space jump above. It is possible to attack this connection and cut, but that cut is going to be on the second line, where the black player can capture the cutting stone. The third case - the three-space jump - is more complicated, and has lots of possibilities. [Perhaps there should be a web page just for this situation. 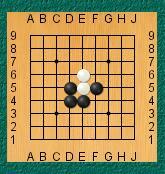 Maybe one day...] The obvious place to attack is right in the middle, and black has the choice of attempting to join the two stones, by attacking the white stone directly, or forcing the white stone to run to the middle while building two separate strong positions on either side. As usual, everything depends on what else is happening on the board. This last case is instructive: sometimes a player makes an extension that invites the other player to invade because he knows the invasion will strengthen his position.